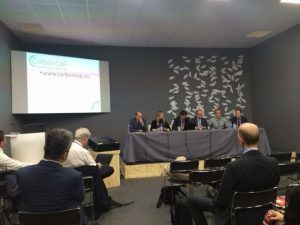 Climate Strategies co-hosted various side events at COP21 in Paris this November/December 2015. The list below shows the events and photos. We also had an exhibit (booth 28A, Hall 4) for the entire two weeks, presenting our new projects, publications and events. While the Paris negotiations will decide the future framework for these INDCs, this event wants to look at means of supporting implementation of national contributions that already exist and could be strengthened. Specifically, the discussion focused on technology needs assessments (TNAs) and current climate finance flows. 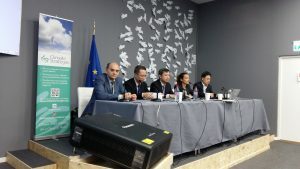 The discussion was organised within the work done by the EU funded research project POLIMP, which aims to make information on climate policy choices and their implications at EU and UN level accessible to decision makers. 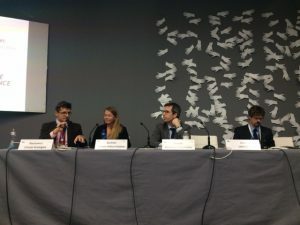 The side event included presentations by Barbara Buchner from CPI, the European Commission and UNFCCC (agenda in the download box). The event presented an overview of China’s mitigation policy and China ETS Pilot schemes. We also launched the Special Supplement of the Climate Policy journal featuring the latest research on China’s low carbon policy. Side event: Accountability after Paris. Who will hold states to account for living up to the climate change commitments they make in Paris and how? This seminar will explore the challenges and opportunities of the different ways to do this. 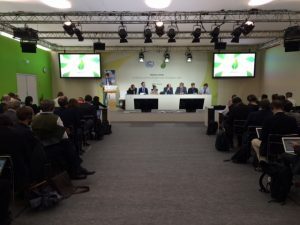 Researchers, civil society and government experts will make presentations and engage in discussions with the audience on this key aspect the effectiveness of the Paris Agreement. Organizers: Wageningen University Public Administration and Policy Group with Climate Strategies, One World Trust and International Environment Forum. Place: Netherlands Climate Pavilion (Blue zone). 14.00-14.05 Introduction to the topic, program and speakers: Robert Whitfield, OWT. 14.05-14.20 Four pathways for accountability – challenges and opportunities. Dr. Sylvia Karlsson-Vinkhuyzen, assistant professor Public Administration and Policy at Wageningen University. 14.30-14.40 Personal and professional accountability: an ethical challenge. Dr. Arthur L Dahl, President of the International Environment Forum. 14.40-14.50. Commentaries from government experts: Gilberto Arias, Advisor to the delegation of Marshall Islands and former principal negotiator for Panama. 14.50-15.10 Plenary discussion. Questions from the audience and an open discussion on the challenges and opportunities to strengthen accountability in relation to the Paris Agreement. 15.10-15.30. Roundtable discussions. Panellists each join one of the round tables and continue discussion with the audience. Side event: Investment in low-carbon technologies and materials RD&D. Topic: Bio-CCS Part 1: Why the IPCC says we need it OR Bio-CCS Part 2: The lowest-hanging fruit to carbon negative? In recognition of this momentous event, Taylor & Francis are proud to offer free access to all issues of Climate Policy, a world-leading journal publishing high-quality policy research and analysis, published between 2000 and 2015. PLUS explore our specially curated article collection showcasing the latest academic research on climate change, greenhouse gas emissions, and environmental policy. Click on any of the articles below to claim your FREE access and start reading now. 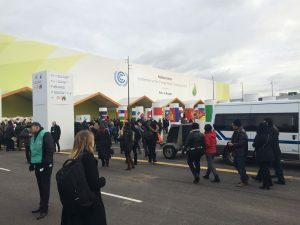 Washington University (WU) is hosting a booth the first week of COP21 highlighting Young RINGO work and they need your help! We know that the Young RINGOS attend the COPs in many capacities: some are conducting research; some are supporting country delegations or NGOs; some are serving as ambassadors to their home schools and communities; some are doing other cool things! If your delegation would like to participate in our booth – please let WU know on: martin@wustl.edu. Participation could be as simple as letting your students know about it, to having a block on the wall of our booth, to having a QR code to link to your research, to participating in some of the social events. See below for how they see the booth working. Just send WU an email and they will go from there. This side event will bring together researchers and policy makers to discuss new research, data gaps and implications for climate policy and the post-2015 development agenda, with a particular interest in assessing research needs in developing countries. This is scheduled for 02 December 2015 from 17:45 to 19:15. We are looking for 5-7 RINGO members to participate in our session who would give a 5 minute “mini-TED talk” on their research. The talk could focus on interesting new research underway or areas where new research is needed. Additionally, it should be geared toward a general audience who may not know much about climate change. We encourage submission from young researchers, including Ph.D.students. If you are interested in presenting, please submit a proposal consisting of a short abstract (150-200 words), along with your name, title, affiliation and contact information by November 2nd to Diane Husic at husicd@moravian.edu.